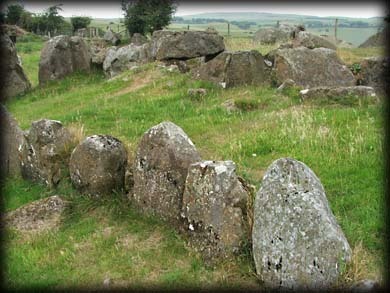 Situated in the townland of Knockoneill stands this well-preserved court tomb, located on a small ridge 210 metres high overlooking the Bann Valley. The forecourt is semicircular with some more orthostats running across the front giving the impression of a full-court, but these were found to be a later edition. The tomb has two chambers and a subsidiary chamber at the eastern side of the tomb, the backstone of the main chambers is used as a side wall of the subsidiary tomb. At the entrance to the tomb is a small antechamber which was formed by doubling up with the door jambs, which can be seen in the image shown right. The kerb is also well -preserved, the eastern kerb can clearly be seen in the top image and the western kerb in the image above. 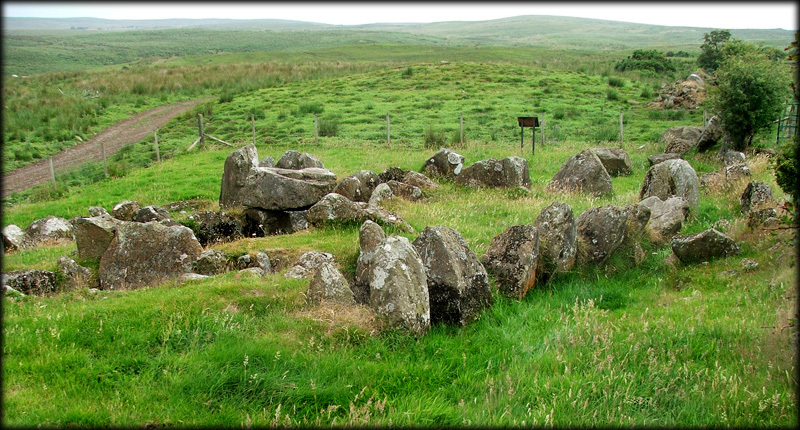 Around the main tomb are traces of a later circular kerb, bronze age burials were found in the forecourt and the tomb is believed to have been covered with a round cairn during this period. If you are near this area then I would recommend you visit to this tomb. 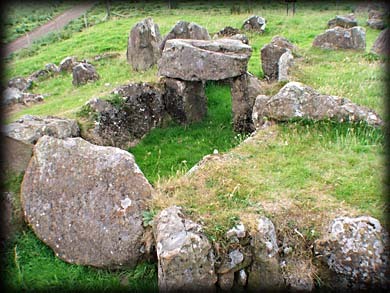 Situated: 4 kilometres WNW of Swatragh, County Derry. 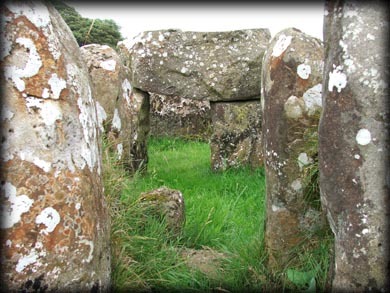 From Maghera take the A29 north to Swatragh, once there turn left, then take the third left for Knockoneill (sign-posted), drive 500 metres south, the tomb is across a field next the first house on your right. Discoverer Map 8: C 8188 0881. Last visit July 2006.